We often think of Christmas as a magical time in which to relax, reflect and celebrate. For many of us, however, Christmas can become a stressful period in which shopping, housework and family obligations loom large. Each year, Helen Little and her extended family head to their chalet in the French Alps to get away from it all. We caught up with Helen to hear more about her white Christmases. Q. Tell us a bit about your ski chalet. A. My family and I share a ski chalet in the French Alps with a number of other relatives. The chalet is in a beautiful location and the surrounding scenery is simply breathtaking. We fell in love with the area whilst there on a ski break about ten years ago and encouraged our relatives to join us in finding a property there. We all own the property and operate an informal, and relatively flexible, time share scheme across the year. It works perfectly because we all know and trust one another and are secure in the knowledge that we will all care for and respect the chalet. Q. Who do you spend Christmas there with? A. Christmas at the chalet is a big family affair. My husband and I and our two children go there most years, as do my parents and my sister and her family. We are all obsessed with snow sports. My mum is very attached to her snowboard! We usually stay for around seven days. The chalet only has three bedrooms, but thankfully they are large, with room for a double bed and a bunk bed in each. It's a tight squeeze to accommodate all of us but it's good fun. It's almost like camping inside! Q. What do you do for food and entertainment? A. The chalet was a sizable investment for all of us. With that in mind, we keep things cheap and cheerful. Rather than eating out, we do a large grocery shop at the start of the week, stocking the cupboard and fridge with all that we'll need. We split the cost of the groceries between all three families. We love French wine and, thankfully, it is relatively cheap, so we stock up on a case or two for the adults. We also have a cupboard full of well loved board games, all of which usually make an appearance. We bring along a stash of DVDs and we all raid our local libraries for novels the week before our trip. We ski for a few hours each morning, although we usually hang up our skis on Christmas day. Most of all, we love cooking and eating together as a family. The living/dining area boasts a huge dining table that is truly the heart of our shared holiday home. Q. 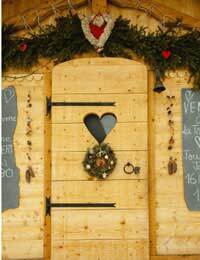 Do you observe many Christmas traditions at your chalet? A. We embrace some and leave the others! With baggage restrictions and our bank balances in mind, us adult don't buy gifts for one another. We all treat the children though. When it comes to Christmas dinner, we go the whole way. Turkey, sausages, bacon, apple sauce, brussel sprouts, Christmas pudding and all the works; that's us. Our Christmas lunch is the focus of the day and often lasts for several hours. We divide up the cooking and washing up chores so that everyone has a role and no individual is saddled with housework on the big day. I'm almost ashamed to say that we don't have a tree. We do decorate in other ways, however. The children like to assemble wooden nativity scenes, make paper chains and hang glittery streamers. Besides, we can see plenty of beautiful evergreens through the windows of our chalet. Oh, and by the end of the week, the land surrounding the chalet is always densely populated with snowmen! Helen and her family's festive celebrations prioritise family, food and laid back fun; the modern fairytale Christmas. If you're thinking of taking a ski break, why not take a leaf out of Helen's book and travel over the Christmas period?